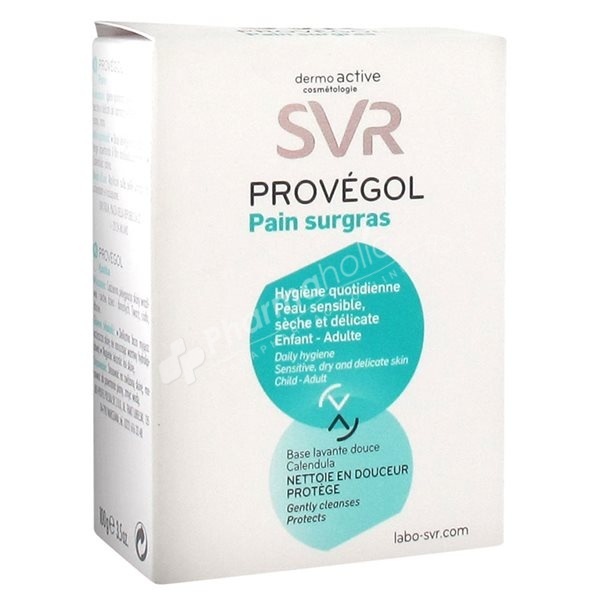 Thanks to its formulation without soap and its washing base soft enriched in credits surgraissants, SVR Provégol Ultra Rich Soap 100g carefully cleans the most sensitive skins by respecting the physiological pH of the skin and its film hydrolipidic. Thanks to its formulation without soap and its washing base soft enriched in credits surgraissants, SVR Provégol Ultra Rich Soap carefully cleans the most sensitive skins by respecting the physiological pH of the skin and its film hydrolipidic. It reconstitutes defective protective film hydrolipidic dry skins with its hydrating agents and surgraissants. It alleviates and softens the skins irritated thanks to the concentrated extract of Calendula. pH 5,5. Soap free. Paraben free. Disodium Lauryl Sulfosuccinate, Sodium Lauryl Sulfate, Zea Mays, Cetearyl Alcohol, Sodium Cetearyl Sulfate, Sodium Myristyl Sulfate, Paraffinum Liquidum, Aqua, Calendula Officinalis, Isocetyl Stearate, Glycerin, Lactic Acid, Cl 77891 (Titanium Dioxide), Methylparaben, Phenoxyethanol, Parfum (Fragrance). Active Ingredients: Base lavante douce, Huile surgraissante non comédogène, Extrait Glycérique de Calendula.